My passion for the brand started at the young age of 18. My first 356 restoration taught me how grand the aesthetics should be on these fine pieces of art called Porsches. Since my high school days, I have been striving for perfect aesthetics on all my restorations. With a great team like I have put together here at VSR, I’m reaching world class renowned restorations. I have been so fortunate to have learned all the disciplines relating to Porsche restorations that I can pass not only the skills but my enthusiasm. The passionate journey through a restoration is elevated by working closely with my clients. It’s of utmost importance that I make their dream come true by returning a stellar piece of art. Even though I’m the owner, I don’t sit in my office much for I long to have a significant share getting dirty on your car. Jeremy is our assembly/disassembly guy. He also wrenches, and know’s his way around 911s. He has been in the field of restorations well over 20 years, has owned a performance shop, and brings his vast experience to Vintage Sportscar Restorations. Jeremy is passionate about the Porsche brand and it shows in his dedication and attention to detail. George, our painter and body man, brings 38 years of experience to Vintage Sportscar Restorations. At the age of 14 George was learning the trade in his parents' shop. He is passionate about cars and making them look showroom quality. He has mastered the use and application of our paint of choice, Glasurit. George is a detail worker. His attention to detail is amazing. George has been with VSR from day one. Most importantly, George enjoys his work. With over 25 years of experience in the coachwork business Ricardo is no novice. Ricardo is our Porsche body man, fabricator and painter. Ricardo also started as a young man helping in his older brothers shop. We enjoy Ricardo’s approach to his work and positive attitude. He enjoys custom fabricating and fitting panels to OEM specifications. 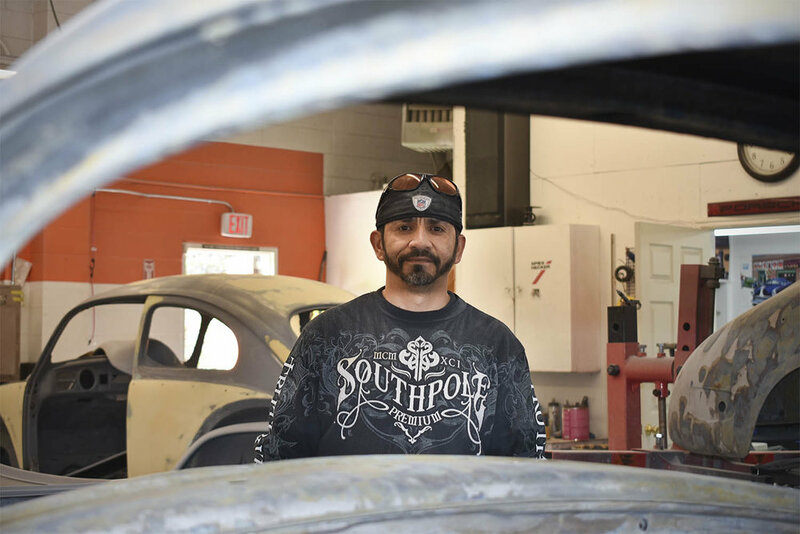 Even though he has been with Vintage Sportscar Restorations a short time, he hit the ground running and since then, he has proven himself as a dedicated worker. Bruce, is our fabricator and upholstery guy. He brings 39 years of coachwork to Vintage Sportscar Restorations. With a degree from Wyoming Tech. in painting and auto body, Bruce brings vast knowledge. His fabrication experience is put to use on our Porsches. Additionally, Bruce is a master worker on convertible tops, headliners and carpet installs. Bruce enjoys fabricating and is very dedicated to his profession. Tony is our apprentice. He has proven to be dependable and responsible. At only 19 years of age, Tony demonstrates dedication and passion working and learning about these great cars. In his short time here as VSR, he understands the importance of doing the job right the first time. Meet Buster, our English Labrador shop dog. Buster was born in Winnipeg Canada. After a few months, he was transported to Vancouver BC where I took ownership. We love Buster. He has a great disposition and is always happy to please.